Just 1 Week Left to Grab Oubliette 7 for FREE! I normally run the Oubliette giveaways for 1 month, but as it's holiday time, I'll leave it open for an extra week. A big thank you to everyone that has already downloaded a copy. And an even bigger thank you to everyone that has bought back issues or printed versions. Lulu have been offering some generous discount codes over the last few weeks. Presently, the code COUNTDOWN will give 25% off any order until 14th December. Lulu also has all the back issues of Oubliette along with a compilation edition of the first four issues. 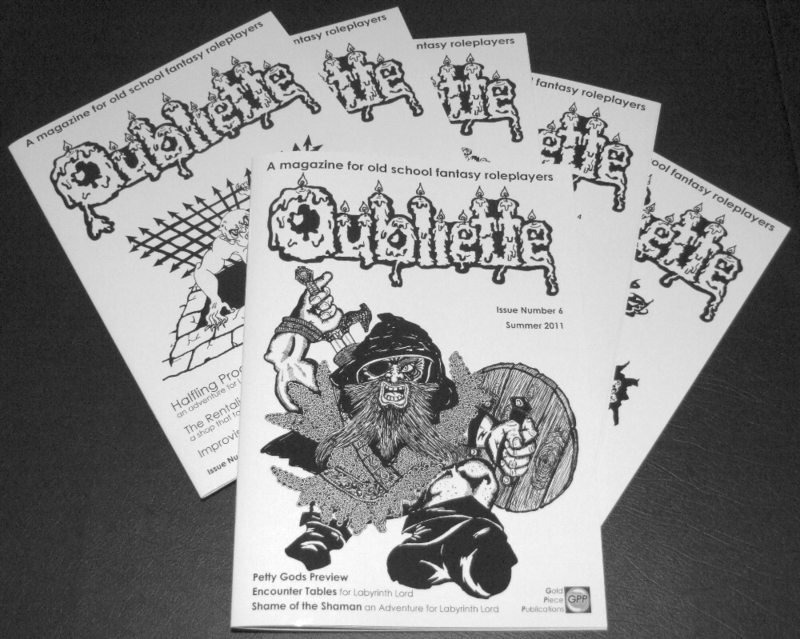 Over 500 downloads of Oubliette Issue 7 in the first 24 hours! Downloads of the latest issue are really motoring. 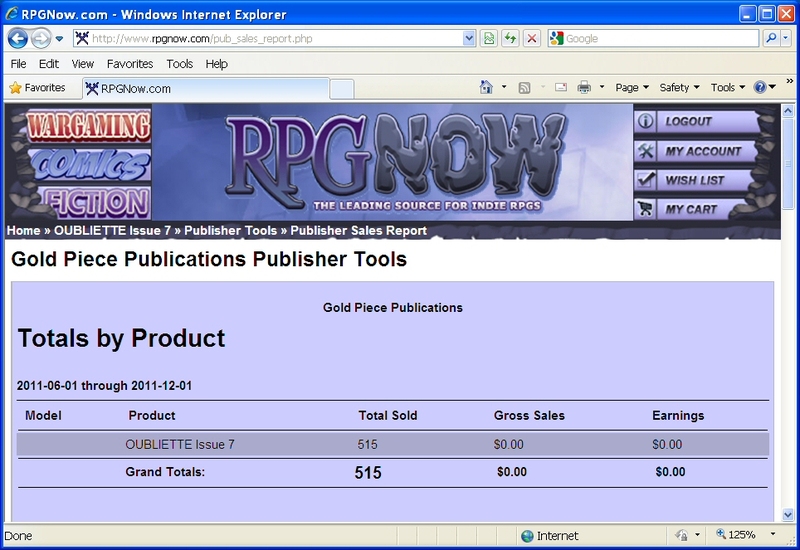 I sent out 1,300 emails through RPGNow.com earlier today and people started acting on them within minutes. I'm also really thankful to all the blogs that have given the free download a mention. In the first 24 hours of the Issue 7 giveaway over 500 have been downloaded, which is over 100 more than we had at the same point for Issue 6. Tomorrow I'll catch up on promoting the giveaway on gaming forums and I'll also start my direct mail campaign to UK game stores. Oubliette Issue 7 - OUT NOW! 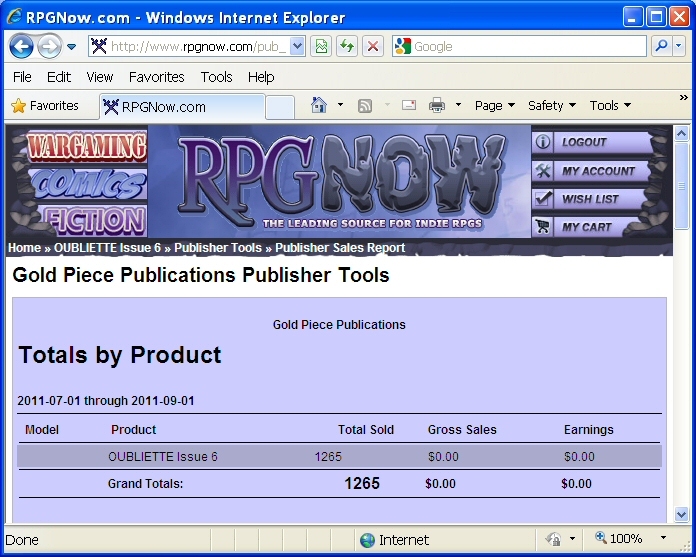 Download your copy of Oubliette Issue 7 from RPGNow.com, FREE for a limited time only! 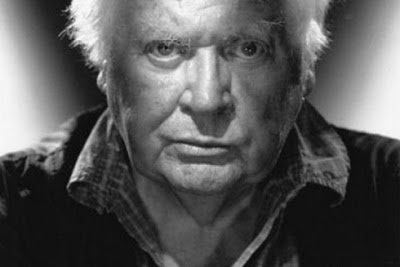 Just heard on the radio that Ken Russell passed away on Sunday, after suffering a series of strokes. My two favorite films of his are the rock opera Tommy, and his adaptation of Bram Stoker's Lair of the White Worm. They would probably appear at opposite ends of any film critic's list, but I think they are both magnificently camp and highly enjoyable. I'm tempted to pen an adventure based on one of them - no prizes for guessing which one. Quite sad to read that he found it difficult to get funding for films from the 90s onwards. I can't help but smile when I try to imagine what else he might have come with and put on film. Oubliette Issue 7 for FREE! Issue 7 of Oubliette is due for release later this week. 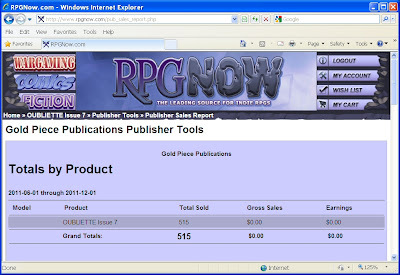 Following the terrific response we had to the Issue 5 and 6 giveaways, Issue 7 will also be available for a limited period as a free download from rpgnow.com. I had an enjoyable day at Dragonmeet in London yesterday. 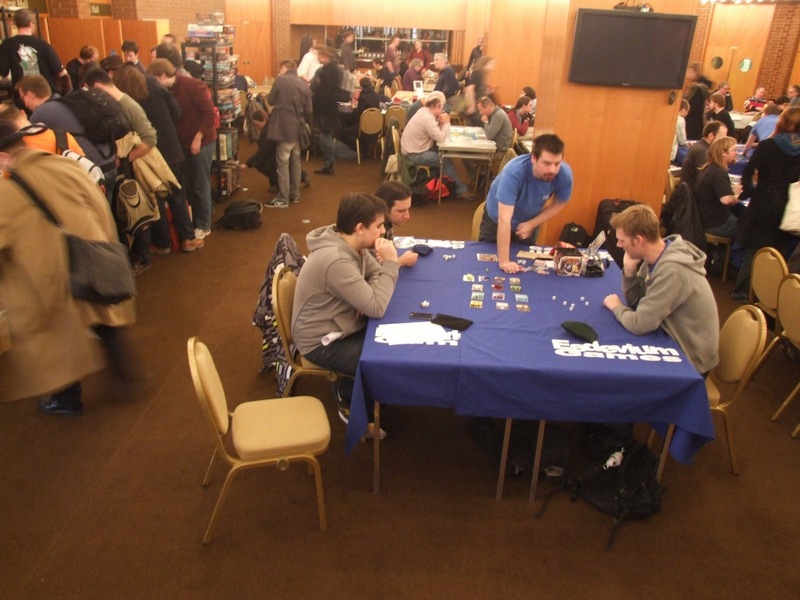 It was my first visit to the show and it was great to see so many people in one place playing games. There was a good trade hall with plenty of tempting stuff, although not as much variety as there was the UK Expo in Birmingham. My wife bought my Christmas present from one of the stands, but as it's a surprise, I'll have to wait to find out what it is. 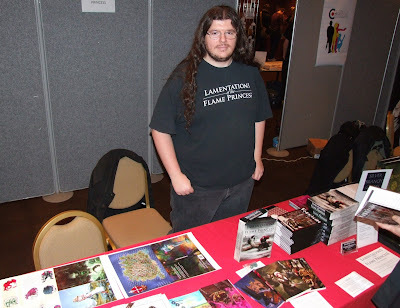 On the OSR front, Jim from LotFP had a stand and seemed to have a good flow of customers. There was also a Fighting Fantasy stand where Ian Livingston gravitated for a while (he was also one of the seminar guests) to sign books for visitors. Even with those two stands, the OSR still seemed under-represented. No retroclones were on sale, and even Leisure Games did not seem to have their usual selection of OSR modules and supplements on offer. I gave out just over 100 copies of the mini Oubliette (Issue 6.5) so hopefully, when Issue 7 goes on download later this week, we'll have a few new readers. My immune system has been rather lackadaisical in its approach to keeping me healthy. I have been ill the last week. On Monday, I insisted on working and ended up snotting clear mucas on two ink drawings (both now on sale for exhorbitant prices, complete with artist's DNA(not really)). I'm in catch up mode now. For every mag we've done, I've always been ahead of the game. I hate being behind. 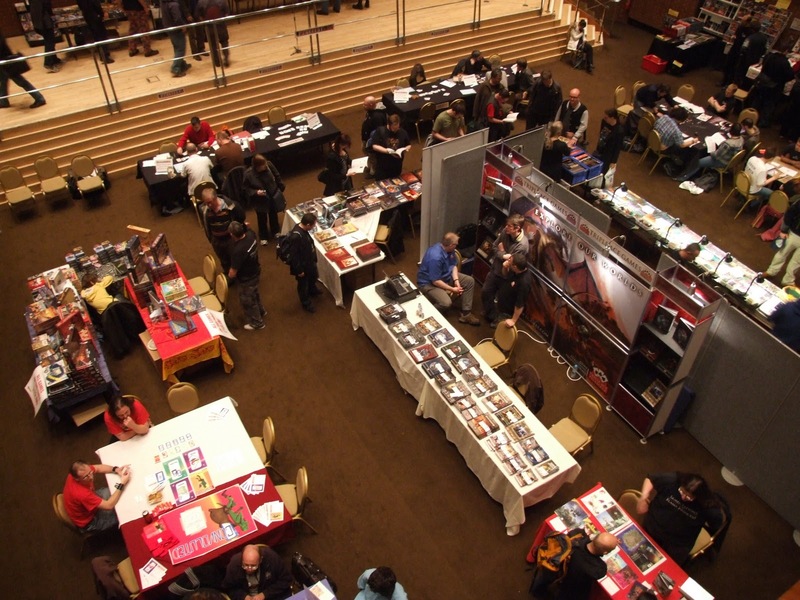 Tomorrow, Pete and I are going to Dragonmeet in London, which I'm very excited about. Of course, I shall be taking my sketch pad and finishing off the Sithakk illustrations in the evening. We're taking a camera, so stand by for some bloggage. Proof reading continues apace, and we're confident that next week, Oubliette Issue 7 will be ready for release. Hurrah. True Neutral- A true neutral character does what seems to be a good idea. He doesn't feel strongly one way or the other when it comes to good vs. evil or law vs. chaos. Most true neutral characters exhibit a lack of conviction or bias rather than a commitment to neutrality. Such a character thinks of good as better than evil after all, he would rather have good neighbors and rulers than evil ones. Still, he's not personally committed to upholding good in any abstract or universal way. Some true neutral characters, on the other hand, commit themselves philosophically to neutrality. They see good, evil, law, and chaos as prejudices and dangerous extremes. They advocate the middle way of neutrality as the best, most balanced road in the long run. True neutral is the best alignment you can be because it means you act naturally, without prejudice or compulsion. However, true neutral can be a dangerous alignment when it represents apathy, indifference, and a lack of conviction. Rangers- Rangers are skilled stalkers and hunters who make their home in the woods. Their martial skill is nearly the equal of the fighter, but they lack the latter's dedication to the craft of fighting. 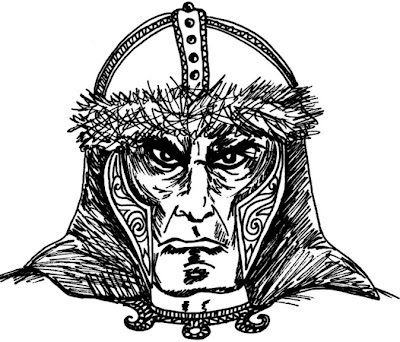 Instead, the ranger focuses his skills and training on a specific enemy a type of creature he bears a vengeful grudge against and hunts above all others. Rangers often accept the role of protector, aiding those who live in or travel through the woods. His skills allow him to move quietly and stick to the shadows, especially in natural settings, and he also has special knowledge of certain types of creatures. Finally, an experienced ranger has such a tie to nature that he can actually draw on natural power to cast divine spells, much as a druid does, and like a druid he is often accompanied by animal companions. A ranger's Wisdom score should be high, as this determines the maximum spell level that he can cast. Rogues- Rogues have little in common with each other. While some - maybe even the majority - are stealthy thieves, many serve as scouts, spies, investigators, diplomats, and simple thugs. Rogues are versatile, adaptable, and skilled at getting what others don't want them to get. While not equal to a fighter in combat, a rogue knows how to hit where it hurts, and a sneak attack can dish out a lot of damage. Rogues also seem to have a sixth sense when it comes to avoiding danger. Experienced rogues develop nearly magical powers and skills as they master the arts of stealth, evasion, and sneak attacks. In addition, while not capable of casting spells on their own, a rogue can sometimes 'fake it' well enough to cast spells from scrolls, activate wands, and use just about any other magic item. Oubliette Issue 7 will be out in the next couple of weeks and, as usual, I'll put up the contents page about a week before the issue is released. In the meantime, I've created a special mini promotional issue of Oubliette (Issue 6.5) to use for promotional purposes. 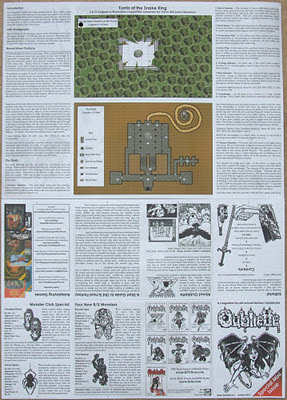 The issue is A6 sized, and is printed on a double-sided A3 sheet, and then cut and folded like a PocketMod. I'll be sending copies to UK games stores, to promote the free download of Issue 7. I'm also sending a batch of them to Otherworld Miniatures who will be including them with orders in the run-up to Christmas. The content inside is mostly taken from the forthcoming issue, so our regular readers won't be missing anything if they don't get one (apart from the Succubus on the title page). However, if you simply must have one in order to complete your Oubliette collection, then you may order a copy using the paypal button below. Nearly all of the purchase price goes to the Royal Mail and Paypal, but there's no easy way around that. If anyone wants to buy several copies at once, send me an email and I'll see what I can do. 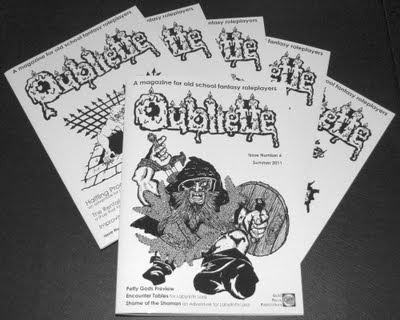 Also, if you are in the UK, I've still got a handful of the Oubliette Issues 1-4 Compilation available for £9.50 including P&P (which should work out cheaper and faster than ordering through Lulu), and I'll throw in a couple of the mini issues as a bonus. "Why can't I work faster?" I asked Pete during a recent phase of self-hatred. He's right. And it is official. I'm an idiot. If you were thinking of buying a set pre-Christmas, now may be as good a time as any. I recently received review samples of two of the smaller sets from Lego, and I have been playtesting them for a review which will appear in the next issue of Oubliette. 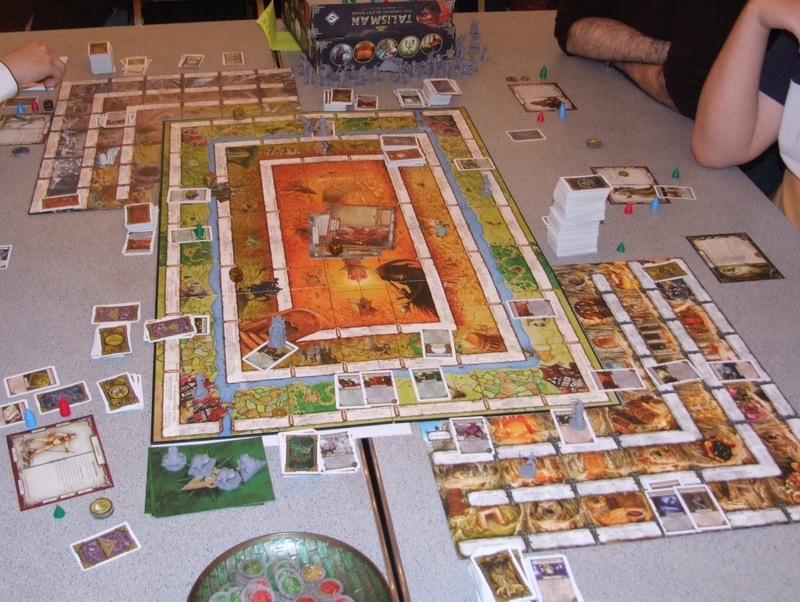 Both of the games I have played have been great fun, and my five-year-old daughter is now routinely picking up the box sets and demanding a game. It is a fait accompli that she will find the other two sets in the range under the Christmas tree this year, and I am looking forward to playing with all four sets linked together, even if the likelihood is high that she'll thrash me. Yes, it's Sneak Preview time. 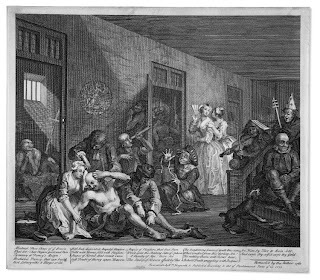 Tales from Hell and Mouse Watch are Oubliette magazine's on-going cartoons. 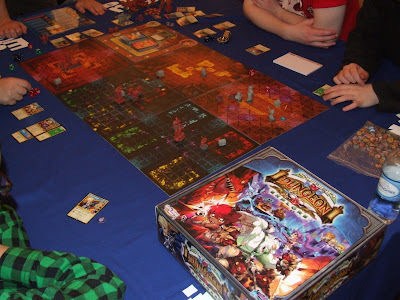 Tales from Hell is an affectionate nod towards Michael Curtis's Stonehell Dungeon, detailing the lives of Kobolds(the sanitary engineers and trap-setters of the dungeons they inhabit), their Buckets, and the Adventurers who venture into the dark gloom of the Kobold's habitation. 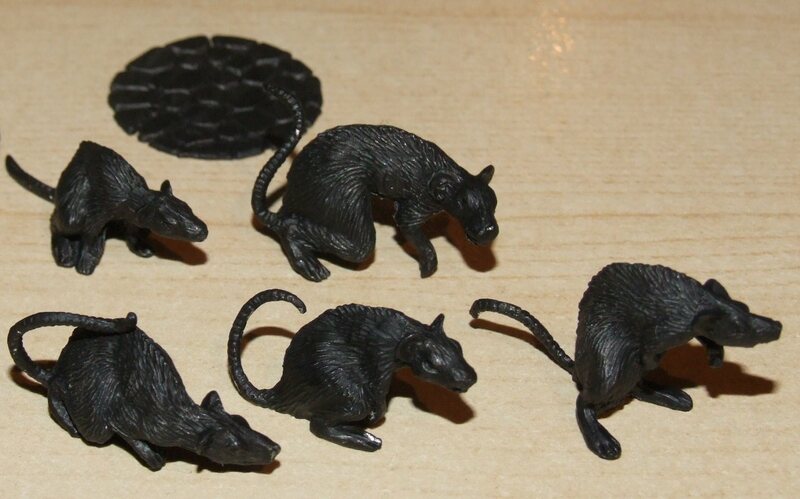 Mouse Watch is our morally challenged version of David Petersen's beautifully realised Mouse Guard Series. The mice in Mouse Watch are amoral, filthy little critters, whose callous disregard for life and each other are the continuing subject matter of the cartoons. Just finished a rehash of the Creeping Statues from Oubliette Issue 2. The original ideal, that I espoused, which was to keep drawings to a bare minimum line-wise in my endeavour to save people ink, has, by demand, now evolved to something a wee bit more complicated. Here's a comparison of the two styles. I had a great meeting with Richard Scott of Otherworld Miniatures a couple of weeks ago. As a result, not least because of the review samples I came away with, my interest in miniatures is renewed. It's been about 20 years since I last painted miniatures on a regular basis, so I'm a bit rusty. Issue 7 of Oubliette will have an interview with Richard and a feature on miniatures. In the meantime, I plan to paint the selection of figures he kindly gave me, and post a paint log for each of them. I'll include brief details of the paints and materials used, the basic techniques, and step-by-step photos. I'm not claiming to be an authority on miniature painting, or to have a great talent for it, but beginners might pick up a few tips on how to paint miniatures to a reasonable gaming standard. I'll also find the painting logs useful in case I need to paint more of the same type of figures and need them look the same as ones painted previously. Matt black undercoat (Humbrol Matt Black enamel). If you have a matt black spray it will save time. Sometimes I use a white undercoat, but as the rats are going to be quite dark, black gives a better base. The undercoat allows water based paints to be applied more easily and produces a stronger, more even finish. Dark brown basecoat (Miniature Paints Umber). Gives a solid dark brown shade. Thanks to the black undercoat only a thin coat is required. Medium brown drybrush (Vallejo Flat Earth). The whole miniature is drybrushed quite heavily so it looks much lighter. Light brown drybrush (Vallejo Light Brown). Again over the whole miniature but with a much lighter touch. Then heavier drybrushing on the nose, paws and tail. Light flesh drybrush (Citadel Elf Flesh). Only on the nose, paws and tail. Dark brown wash (Miniature Paints Umber). Only applied to small areas as required to tidy up imperfections left by stray drybrushing. 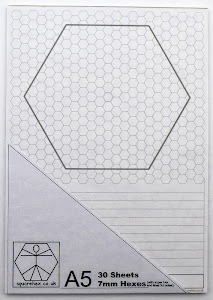 White (Citadel White). Paint the teeth and also use as a base colour to help the eyes stand out. Red (Citadel Blood Red). Paint the over the white laid down on the eyes. 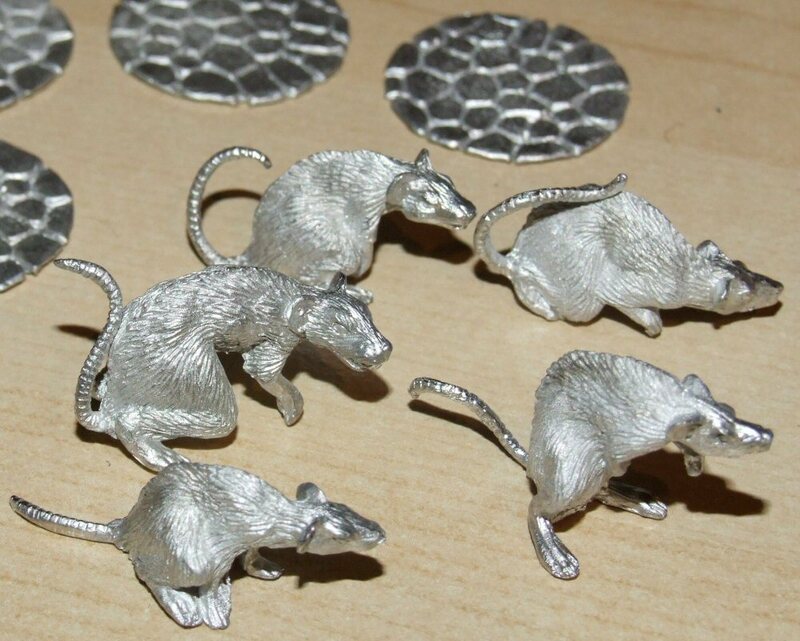 The rats come with thin metal flagstone effect base and 25mm round plastic bases. For me these are a little large so I made my own bases using pennies and cork discs. I'll make use of the flagstone ones with some other figures though. Black wash (Humbrol Matt Black enamel). Thin coat applied to cork base. Varnish (Quickshade Stron Tone). This varnishes and shades the figure in one go. It softens the effect of drybrushing to give a neater finish. Matt Varnish Spray (Army Painter Matt Anti-shine Spray). This is optional and gives the flat matt finish that most painters prefer. 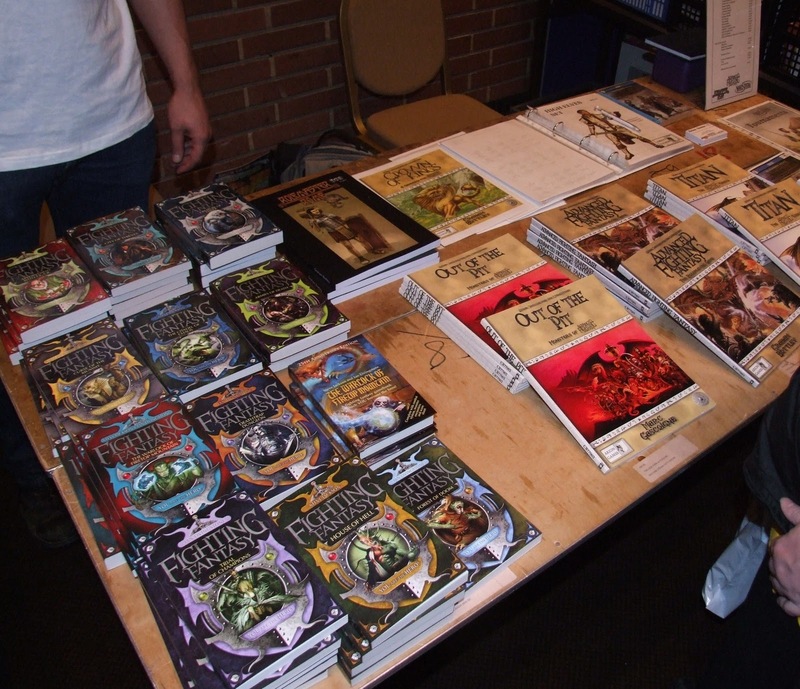 I ordered them from Different Worlds Publications who have an enticing range of JG and other titles for sale on their website. Best of all, many of them cost almost the same as their original prices from 30 odd years ago. 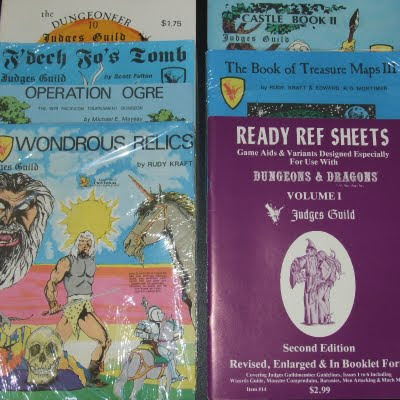 I have James at The Underdark Gazette to thank for posting about his recent purchases from Different Worlds, otherwise I would have never heard about them. To generate a 50" image the projector needs to be 6'6" away from the screen. The only way to acheive this in a normal room is to use a mirror set at 45 degrees. The mirror needs to be fairly rigid otherwise the geometery of the image will be distorted. 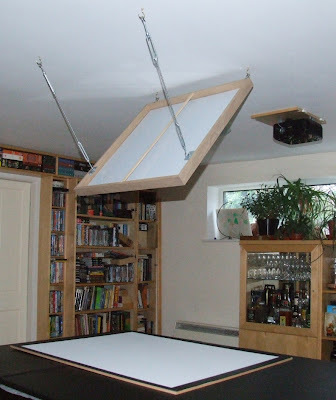 Initially, I wanted to buy a projector with a short throw range which would allow it to have been mounted directly over the screen. However, I spotted this one at almost 70% off so I was happy to put the extra work in. Brightness of at least 2,000ansi Lumens. Most DLP projectors easily meet this. A 4:3 or 1:1 aspect ratio. Widescreen is great for movies but not so good for gaming on. XVGA (1024x768) resolution or better. Budget projectors are 800x600 which is ok at a push. Also make sure your computer can output the correct resolution. Options to flip (mirror) the image if you are planning on a set up with a mirror. Vertical Keystone correction this allows you to make adjustments if the angle of the mirror/projector isn't perfect. Noise level under 30dB. Depending on the setting used mine is 28-33db and I wouldn't want it to be any louder. Some form of manual zoom for fine tuning the image to fit the screen. I first posted about using a data projector in April. Since then, I've used it a couple more times and I'm really pleased with the results. The photos below show the playtest map for Tomb of the Snake King which I'm busy editing for Oubliette Issue 7. Each map has a second layer of solid black added which is then gradually deleted as the players explore each area. 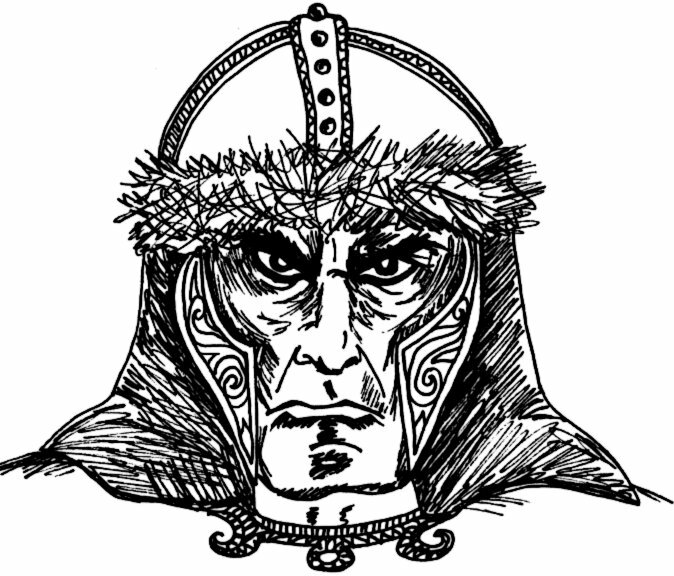 I really enjoy reading other blogs which discuss various aspects of the OSR. It got me thinking: what else am I interested in that might be given the Old School tag. I'll try and think of a new item each week and you can judge whether or not it deserves a place on the Old School Cool Wall. 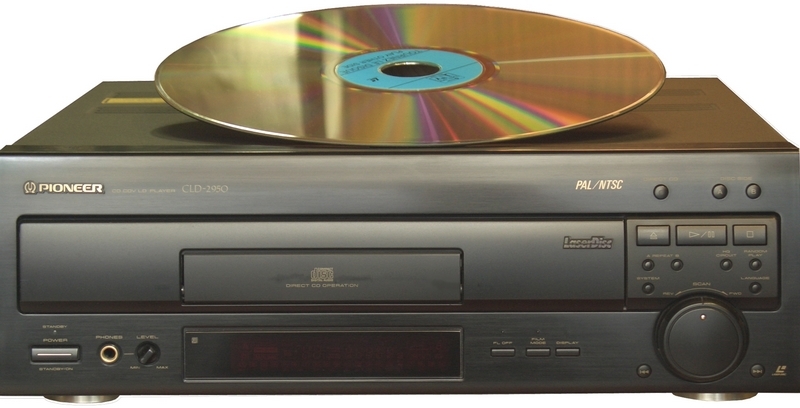 Until the DVD format was launched in 1997 (1998 in the UK), LDs were the final word in quality home cinema. DVD pretty much killed the format overnight. As people dumped their entire movie collections, I took the oportunity to build up my collection. I still own about 300 LDs and a flagship Pioneer deck to play them on. I love my collection. I'll probably keep most of it even after my player kicks the bucket. Much like Vinyl LPs, the discs themselves are a big part of the attraction. Many have gatefold covers, booklets, slip cases or other design features that make them worthy of admiration on a purely aesthetic level. A LaserDisc player in operation is quite a machine to behold. They're very mechanical devices, with genuinely smart engineering including: autoturn a feature that plays both sides of a disc without having to remove it from the player, and an additional pop-out mini loading tray for loading audio CDs. At the weekend, I was reading about the imminent Blu-ray release of the Star Wars films, and the distress being caused by Lucas making even more CGI changes to the original films. Thankfully, I own both the Special Edition LD boxed set and the Definitive Edition Boxed set on LaserDisc. Which, along with my copy of The Star Wars Vault, is all I need to experience 1977 all over again. I'm hoping to have a review of Lego Heroica in the next issue of Oubliette, but in the meantime, here's an image showing the range of different micro figures included in the range. 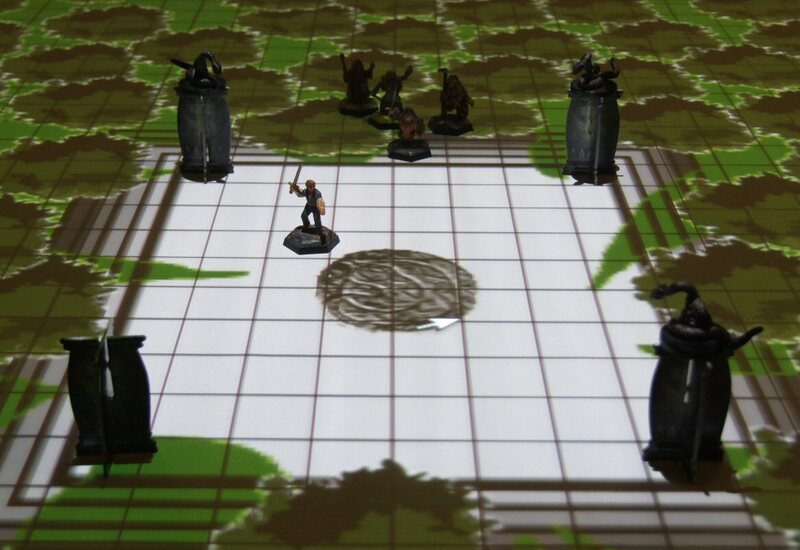 One of the sets (Caverns of Nathuz) also includes some giant bats (which are not micro figures). I think they look great, and I'm already dreaming up D&D stats for the Golem Lord and his Golem minions. However, given that there are 4 sets, I'd hoped that there would have been a wider range of monsters included. Hopefully, the range will grow with additional sets next year. 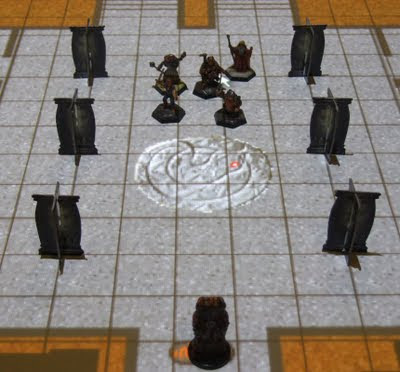 They could actually do some very small encounter sets with half a dozen new micro figures, and a few new weapons and treasure items. The free download period for issue 6 is now over. 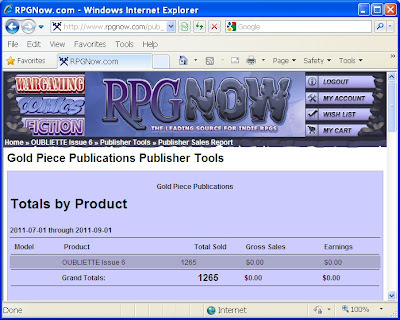 We chalked up an impressive 1,265 downloads, along with dozens of back issue sales. In print, the compilation edition of the first four issues is still selling strongly, but it was also great to see orders coming through for the individual print issues of Oubliette 5 and 6. Special thanks must go to our issue 6 advertisers, whose ongoing support will enable us to offer Oubliette as a limited free download for the foreseeable future. Want to Reach Over 1,200 OSR Customers? Book an advert in Issue 7 of Oubliette. Issue 6 of Oubliette is available as a free download from www.RPGNow.com until the end of August. If you have not had a chance to look at an issue before, here is an opportunity to check it out. Over 1,200 copies have been downloaded so far, making Oubliette probably the widest read publication in the OSR. I expect our next issue to reach over 1500 within its first month of release. Issue 7 of Oubliette is scheduled for November and will once again be available as a free download for a limited period. If you would like to book an advertisement, here are the rates, deadlines and specifications. As a special incentive for Issue 7, bookings of full-page adverts will include a free print copy of the issue with worldwide delivery. DATES: Issue 7 Winter 2011, Book by 30th September, Copy by 31st October. SPECS: 300dpi JPEG, TIFF, in Black and White or Greyscale (I can accept colour but will convert it to greyscale). SIZES: Full Page: 178mm wide x 265mm high, Half Page: 178mm wide x 130mm high. Quarter Page: 86mm wide x 130mm high. 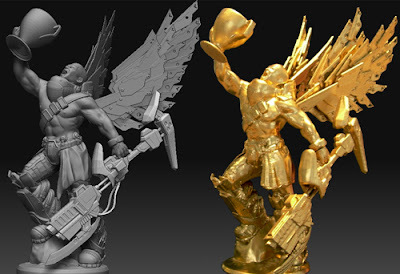 I really enjoyed reading about Hirst Art Molds over at A Paladin in Citadel's blog. I have toyed with the idea of buying a couple of molds, to give it a go, but, so far, I have managed to restrain myself. I know I would really enjoy making them, but I also know I can't spare the time. Another member of my gaming group has just ordered some, so I may feel the urge to follow suit when I see his creations. 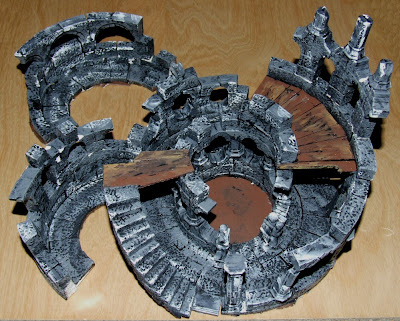 Not wanting to be completely left out, I snagged the ruined tower, pictured below, from ebay for a few pounds. I repaired the transit damage (suffered en route), and removed the cardboard base the ruin was stuck to. 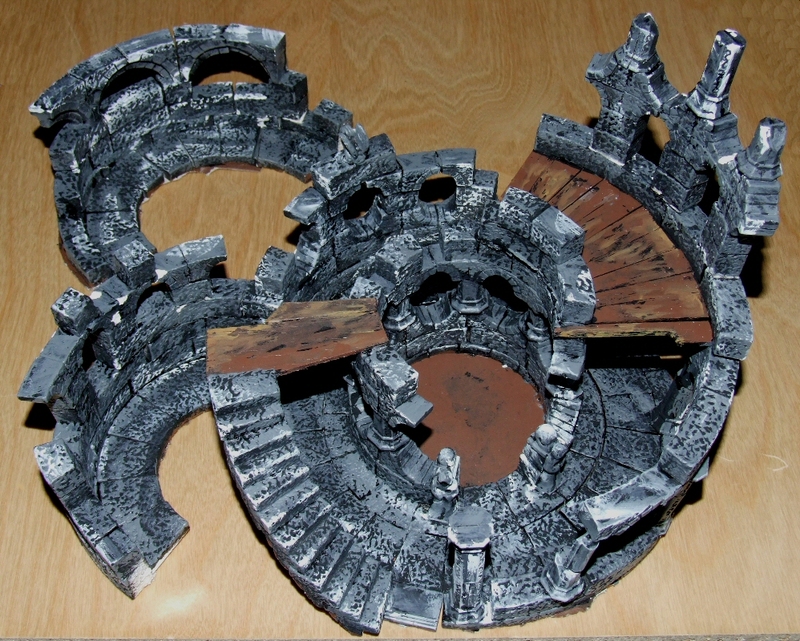 All it needs now is a little bit of paint to cover the repair work, and possibly a dark colour wash or two. Although I'm sure I'll be mainly sticking with my projected game board, the addition of some 3D structures will certainly enhance the experience. It's been a few months since I looked at how 3D printing technology is progressing. The price of the MakerBot machine has dropped $200 bringing it down to $999 (still about £800 from the UK site I checked though). I'm sticking with my prediction that by the end of 2012, we'll see a sub $500 consumer 3D printer on the market. For a good snapshot on the different ways the technology is developing, take a look at the BBC video in the link below. It shows three different types of 3D printers in action. There's now just one week left to grab a copy of the latest issue of Oubliette for free. Then, if you like it, you can head over to Lulu.com and buy a printed version. You can get individual printed versions of all 6 issues along with a great value compilation of issues 1-4. 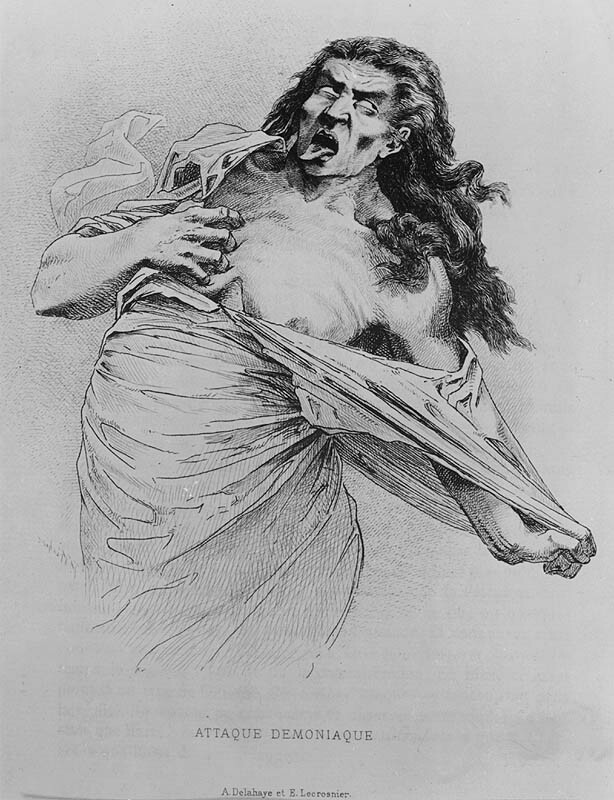 In preparation for one of the Sithakk pictures, in which a Sylvmorten warrior has been poisoned and is beset by tremors, itching, bleeding and fits, I looked up various images to assist with my art conception. 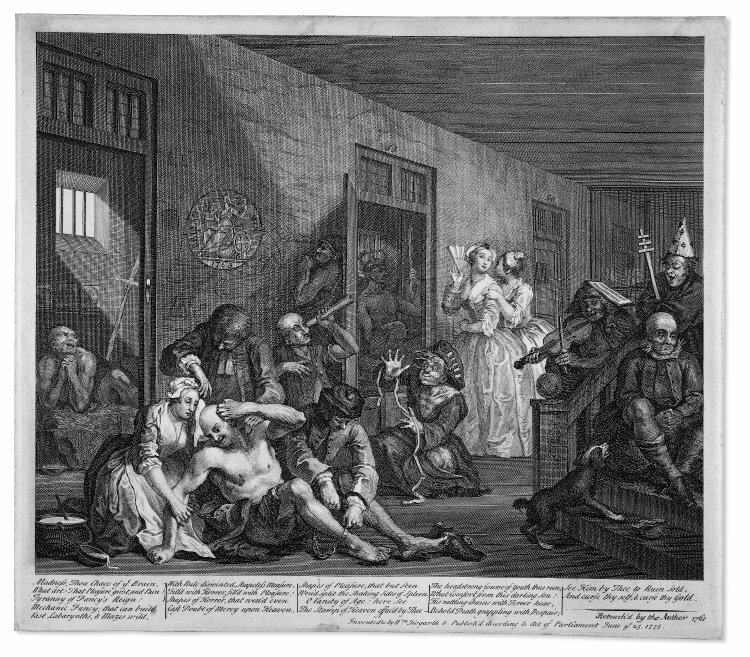 The disturbing artwork depicting inmates of various asylums by 18th century artists gave me all the visual stimulus I needed. It's possible I didn't go far enough, but sometimes, less is more, more or less.